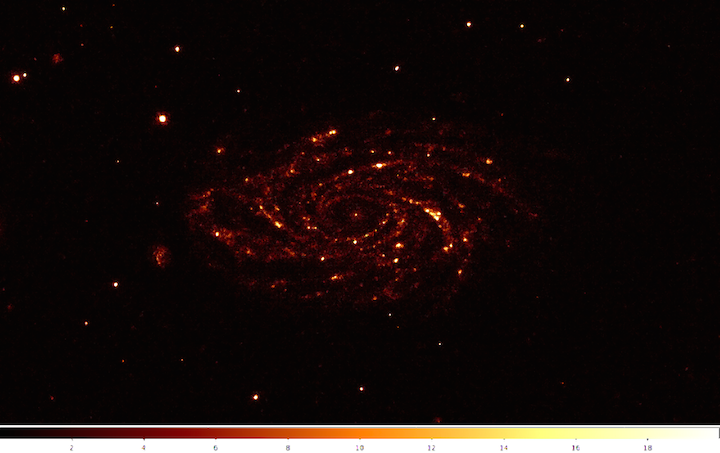 The Near-UltraViolet image of NGC 2336 observed by the UVIT on board the AstroSat. The bright spots along the spiral arms are regions of active star formation. Credits: UVIT Team. NGC 2336 is a magnificent barred spiral galaxy located in the northern constellation of Camelopardalis, or the giraffe. At a distance of 105 million light years away from us, it can even be seen through medium-sized amateur telescopes under dark skies. This galaxy was discovered by the German astronomer Ernst Tempel in 1877. NGC 2336 has a highly developed and splendid spiral arm structure that emanates from a ring of stars surrounding a central bar. The spiral arms contain a number of star forming regions, or nebulae. These nebulae shine because of hot young stars that are bright in the ultraviolet. This was one of the first objects chosen to be imaged by the Ultra-Violet Imaging Telescope (UVIT) on board AstroSat, in order to test its ability to resolve complex structure. The Near-UV (200-300 nm) and Far-UV (130-180 nm) images obtained were spectacular, showing details finer than in the image from the GALEX ultraviolet telescope. Astronomers found that the resolution of UVIT was 1.2 arc-seconds in the Near-UV and 1.5 arc-seconds in the Far-UV, which was much better than the initial goal of 1.8 arc-seconds. This superior resolving power, along with its large field of view, make UVIT an excellent instrument for investigating star formation in large galaxies like NGC 2336.